Through some ill-advised decisions I ended up with five blogs. I maintain the work blog, I have a Tumblr about music and science and a neglected Medium page, I write a weekly travel feature for The Finch and Pea, and of course I have this blog as well. On top of that, I occasionally write for other publications. I don’t have time to instantly turn every idea into an actual post or pitch, because I only rarely have time to sit down and write – and when I do sit down to write, I need to have ideas ready to go. Those ideas come at random moments: at work, on the bus, while half asleep in bed. If I’d write them down in a notebook, I would have to always have that particular notebook on me: if I write my ideas in whatever notebook I’m using at the time, it will get lost in between all the other notes and to-do lists. 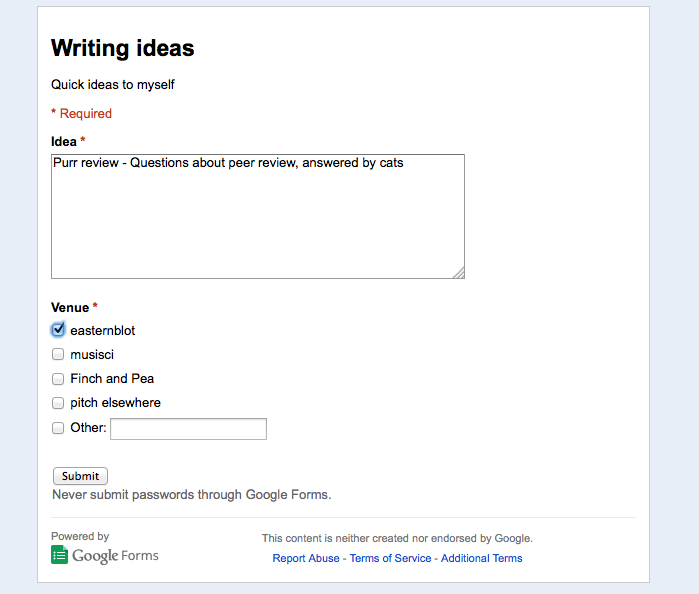 I created a Google Form called “Writing Ideas” in Google Drive. Google Forms are meant to create web surveys or to gather the opinions of the people you email it to. In my case, the form is secret, and only I have the url to find it. I have this form bookmarked on both my personal laptop and my work computer, so that I can jot down ideas no matter which computer I’m at. But what if I’m not at a computer? 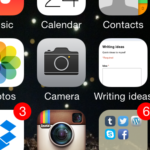 I also have the form bookmarked on my iPhone, and I have that bookmark set to show as an icon on my home screen. It only takes me a single tap to open it on my phone, and it works the exact same way: I enter the idea, submit the form, and it adds it to my spreadsheet of ideas. I’ve tried lots of different note-taking and productivity tools, but for this purpose, for me, a Google Form turned out to be the best solution. I like to keep my writing ideas in a notebook and use Evernote. I’ve tried Evernote but I never seem to quite get into it!